In a skate environment that’s often hegemonic hetero, Cheung is opening doors, building visibility and moving forward. 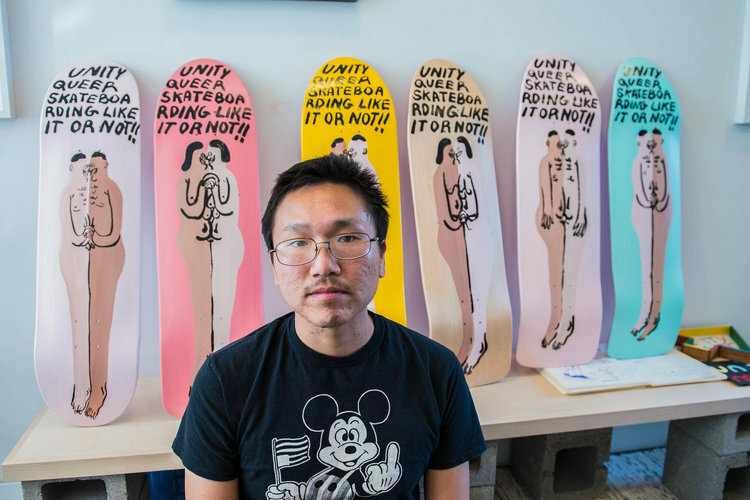 His skate deck graphics are currently hand painted, depicting a variety of people, without shying away from sexuality. Not far away, he and a collective of friends recently opened a space called Unity Mart which features art, zines and an internet radio station. The shop is tiny at just a few hundred square feet, but has a grand meaning to the local community and beyond. Giant Robot Media ｢Unity Mart - Jeffrey Cheung｣ (Video by George Ko and Eric Nakamura) - posted on May 25, 2017. GR: Tell me about Unity and its many branches, especially the new Unity Mart! Jeffrey Cheung: Unity is a name I have used for many different projects that weren’t necessarily meant to go together. Maybe this happened a little bit out of laziness, but it has sort of stuck and I like what the name has become and its positive connotation of bringing different things/people together. It first started as a name for me and my boyfriend’s music project. It was a two piece that eventually grew into a full band with three other friends. Unity Press is also the name I used to write on my zines for fun, but then it actually became an independent press for myself and other artists. One of the most recent projects, Unity Skateboarding, which started in January of this year, is an idea to create more visibility and representation for LGBTQ+ skaters. I have been hand painting each board and sponsoring queer skaters from all over, and it has been really exciting because there hasn’t really been a space or community for us. Hopefully this will bring queer skaters together and inspire the next generation? GR: Was there an event or something that sparked Unity Skateboarding? Like something you saw or experienced? JC: Really just meeting and skating with other LGBTQ+ skaters is a huge inspiration. When I was a teenager I felt like I was the only one and now I know tons of queer skaters and that is super motivating. Brian Anderson coming out and the female skate scene also helped spark the idea, along with tragic events and loss of a friend towards the end of last year gave me an extra push to do something positive during dark times. JC: Unity Mart is the newest project. It is a collaboration with 7 friends, including myself. We are all creative people and decided to have a space where we could bring our outlets together. We officially opened a month ago and it has been going pretty well – it is exciting to have all of our things in one space. The mart is pretty small, but it a multi-functioning space. We are a space for creative products, zines, queer skateboarding, Risograph printing studio, gallery, and live streaming studio for Lower Grand Radio. GR: Any fun stories about The Mart? GR: Is it comfortable being part of the complex in Oakland? I know it’s a step out of the punk rock art studio you’re at, and part of a brand new type of building with a beer garden! JC: Honestly we were very hesitant to move in at first since the new development is part of the gentrification that is going on in this area and we did not want to be a part of that. As a queer person of color I also do not identify with a lot of the other spaces and businesses that are in the complex – but we hope that we can make a difference here and give back to the community and be more than just a retail art space. We recently did an event for queer youth and gave out free skate decks and free zine printing services and we hope that we can continue to make this a safe space for queer youth and host events for them and provide support. Lower Grand Radio is also always looking for people in the community to come and do radio shows, we want to give them an opportunity to share their voices and opinions. We also have a Risograph here in the space and want people to come in and be creative and use it to make art and zines. We are definitely conscious of who and where we are and what this space is doing to the existing community so it is always with mixed feelings. We would love to see more brown and queer owned businesses here in the future. GR: Tell me about the Riso and how it influences your zine making? JC: The Riso is still sort of new for us. We’ve had it for maybe a little over two years. There is definitely a Riso trend right now but it’s great for zines and fliers, and it is very economical. Also, the colors are fun to play around with. We now keep our Riso in the mart available to the public and hope it can be useful for others. GR: You’re able to keep your work simple and I saw you turn out decks with ease. Are your paintings as speedy? JC: I like to be pretty simple in my artwork. My paintings are on the quicker side, but it definitely still takes a little while especially if I am working on a larger piece. The longer I spend on a painting the worse it gets usually. GR: Where did your painting chops come from? You have to be confident to be able to get work out that quickly. JC: I have just spent many years painting and drawing! GR: Can you talk about the iconography of the people in your work? JC: In a lot of my previous work I was mostly depicting imagery related to my own personal sexuality which was more male-centric. I felt the need to make more inclusive imagery for this community based project and am now portraying a wider range of identities, varying skin tones, shapes and genders. Otherwise the imagery wouldn’t be much different from the already male dominated skate industry. GR: Are there a lot of trans skaters? I haven’t necessarily assumed genders of people who are skating by. I’m judging on them on what they’re riding and perhaps if they’re pushing mongo or not. Also what do you think about mongo pushing? JC: There are lots of trans skaters just like there are skaters of all identities. They have always been there but just in the shadows and now we are just gaining more visibility. I am all for mongo pushing! Everyone skates differently and has their own form of expression. No one should tell you how to skate. GR: Skating is sort of bro like. How did you handle that as a surrounding? JC: Even though I am gay, I am still a cis male and I suppose it was easier for me to blend in a little more. I guess you just learn to adapt and pretend like you are somebody else which is pretty awful. Luckily I had friends who were supportive even after I came out, but I know it is not like that for everyone. I really think it’s much harder for trans, female and other people who are outside of the cis male appearance. GR: What tricks are you doing and what’s your local skate spot like? JC: I grew up skating a lot of flat ground and I love skating parking lots. I am trying to branch out though these days but usually trying to keep it mellow.